Rahul Dravid did not quite get the farewell the Indian cricket team had in mind as England were once again able to show more enterprise, spirit and exuberance to dominate proceedings in the fifth India England ODI at Cardiff after rain and Duckworth Lewis were at it for a fifth time in a row. Rain reduced the contest to England requiring the revised target of 270 to be further reduced to 241 from thirty-four overs. The chase though should have got tougher for England with the runs per balls exceeding more than a run a ball. But England have shown a great deal more determination in their batting line up and depth while India continue to struggle with their bowlers. And the story pretty much wrote itself even though England found themselves reduced to four down for 166 in the twenty-sixth over when Jonathan Trott departed, having made sixty-three imperative runs in a partnership with the England ODI captain, Alastair Cook, who made a half century himself. 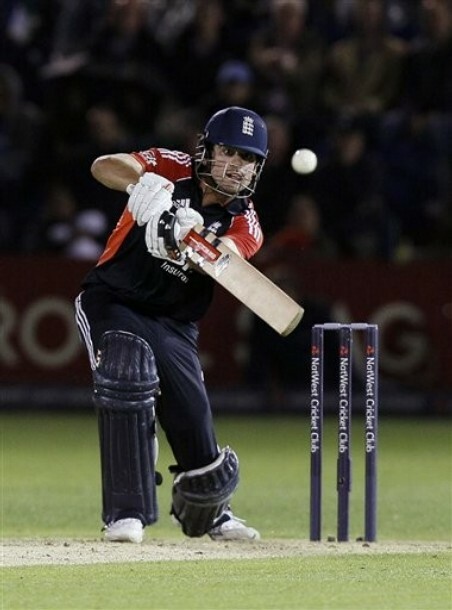 England still needed heroics in the end stages of the match that had seen rain play its part right through the series. India may have fancied their chances as the runs required mounted. However, England have always held the leading edge in the series and the fifth ODI proved no different with Jonny Bairstow, making his ODI debut for England, made it a memorable outing for himself and the team. Ravi Bopara was playing a role that has now become accustomed to him as he has made the best of the opportunity given to him in the absence of England cricketers such as Eoin Morgan and Kevin Pietersen. Rahul Dravid would have been reduced at the end of the day to reminisce on his own personal innings even as India once again let slip an opportunity, which has meant that India literally end home empty handed, having received a terrible drubbing from the outstanding England team who have not put a foot wrong in the entire tour. Dravid may have scored a half century that will be remembered as his final effort, playing his final ODI for India. But this series has not left him much by way of team memories other than his own personal outstanding contribution consistently even as team status and morale sunk as the tour went on. Losing Munaf Patel to another injury would not have helped India. For England though, it must give them immense pleasure and pride to know that they can succeed not only in facile circumstances but also, in situations that demand that they dig deep. That they have done it with a relatively new captain and with a few inexperienced faces bodes rather well for England’s goals over the summer. While Bopara scored precious thirty-seven runs at a run a ball, Bairstow certainly provided the much needed acceleration, scoring forty-one runs off only twenty-nine balls with three sixes that did the damage in that England won the match with ten balls to spare to hand India an embarrassment that will be hard to forget for sometime as England complete 3-0 series win.